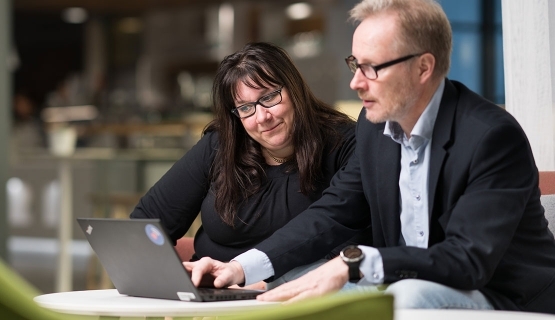 Challenging skills, tangible tools and fresh perspectives are benefits Martti Paajanen, Business CIO at Nordea Life expects from Hanne Laitinen after sending her to Master Class in Quality Program. A yearlong professional education program, such as the Master Class in Quality, is a significant investment, even for a large company. Nevertheless, Martti Paajanen, Business CIO at Nordea Life and Hanne Laitinen's supervisor, is prepared to declare the program worth its price already at the halfway point. The program worth its price already at the halfway point." “For our customers, finance is, in the end, a matter of trust, and trust is built on a successful customer experience. It's our responsibility to make sure the experience really is successful,” Paajanen says. Both Paajanen and Laitinen are IT specialists. In the digitalizing world, their work is often at the very core of the customer experience. “Building and operating information systems is exactly where the customer experience is created. Understanding this, and getting better at it, is important to us,” Paajanen emphasizes. Quality has been on the agenda at Nordea Life for a long time. In addition to training, Nordea Life has invested heavily in quality systems and certifications as well as processes, transparency, and measuring results. Building and operating information systems is exactly where the customer experience is created." Paajanen says the organization is constantly pushing itself to improve. Paajanen expects the program to provide Laitinen with the means to spur on the entire organization and speed up its development. This concurs with the expectations Laitinen – the self-proclaimed Queen of Quality – has set for herself. Her passion is to proactively foresee and solve challenges before they have time to turn into problems. “The Queen of Quality is a tongue-in-cheek title. It's not about setting myself above others, it's about wanting to share knowledge, support, and tools so that, in the ideal situation, things go well automatically,” she says. Her supervisor also emphasizes intrinsic motivation. The employer's desires amount to nothing, if the participant herself is not interested in learning and improving her skills. “There's no point in casting pearls before swine. Hanne is interested in developing both our operations and herself, so it's worthwhile for us to utilize a framework such as this to support and speed up that development,” says Paajanen. It's not about setting myself above others, it's about wanting to share knowledge, support, and tools so that, in the ideal situation, things go well automatically." Many Aalto EE and Aalto PRO programs take advantage of a so-called Echo Team, the objective of which is to ensure that the entire organization benefits from the program. At Nordea Life, the Echo Team has attracted a great number of participants. “For the organization, it's a good way to hear the immediate thoughts that the program has evoked. The Echo Team meetings have led to lively debates and many things have fallen right into place. Hanne, meanwhile, has received concrete feedback from us,” Paajanen says, describing the Echo Team a smart concept. “The discussions we've had at the Echo Team meetings have convinced me that the program will provide me with more than just theoretical knowledge; we'll be able to put things into practice, too,” says Laitinen. From the supervisor's point of view, the program's most useful output so far has been the new perspectives Laitinen has gained on things that are already in the works at Nordea Life. The importance of quality has never been called into question as such, but the program has given Laitinen new tools for concretizing, visualizing, and measuring quality. After all, it's not always easy to specify what quality actually means in a given context. For the organization, it's a good way to hear the immediate thoughts that the program has evoked." One of Nordea Life's strategic objectives is to be the most modern and innovative life assurance company in Finland. According to Paajanen, this means that the company must be both a mental and technological forerunner – and the position of a mental forerunner, in particular, is impossible to achieve by looking at the world from only one perspective. “That's why we want to encourage people to challenge their thinking and seek mental tools. From this perspective, the program and Hanne's role are a good match,” Paajanen says. This series follows Hanne Laitinen as she participates in Aalto PRO's Master Class in Quality program. Through the spring and early summer, we'll hear what it's like to study alongside work and what kinds of insights and eureka moments come up during the program. In the next part of the series we'll learn what Hanne Laitinen has learned about the significance of strategy and how her project work is coming along. Read more about the program. Currently reading: Aalto Leaders' Insight: Queen of Quality, part 2: What is on the supervisor's wishlist?